Another event, another wrap-up. And I'm happy to report that this was another great event. DevLink 2008 saw well over 400 .NET developers converge on speed-ticket happy Murfreesboro, Tenessee for two days of (as one attendee put it) "better than TechEd quality" sessions. For my part, I tried to bring as many updates from the conference as I could while running between sessions and conference parties. 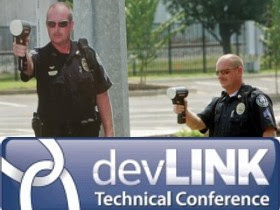 If you haven't seen the video updates, check out Live from devLink 2008, devLink 2008 Montage, and my Silverlight Intro Session Replay. Of course, nothing beats actually being at the event, so start making plans now to attend next year's festivities. As far as sessions go, my two Silverlight sessions went very well. Well, actually, my "Intro" session went really well and my deep dive was okay. Not that the session was bad, but a day that started with a speeding ticket didn't get better when the original room's projector failed and I discovered I had 2.5 hours for a "3 hour deep dive." So apologies to those of you at the deep dive that didn't get to see as much as I had planned. As promised, below are links to download the slides and code from both of my Silverlight sessions. They are great resources if you're trying to get started with Silverlight, and they're completely updated to reflect the latest changes in Silverlight 2 beta 2. Enjoy the learning resources. I'm off to count 120,000 12,000 pennies to mail to the fine state of TN. [Slides] [Code] UPDATE: Josh caught my decimal point error: I only owe TN 12,000 pennies for driving 50 in (as far as my time on the road was concerned) an unmarked 40. Nice slides, wish I could have gone to the conference. 120,000 pennies? $1,200.00 for speeding? Must have been going really, really fast. @Joshua- Good catch! I've updated the post.